It's not unusual to hear of a dedicated tiger mom guiding her cubs, but a tiger dad is a whole new beast. 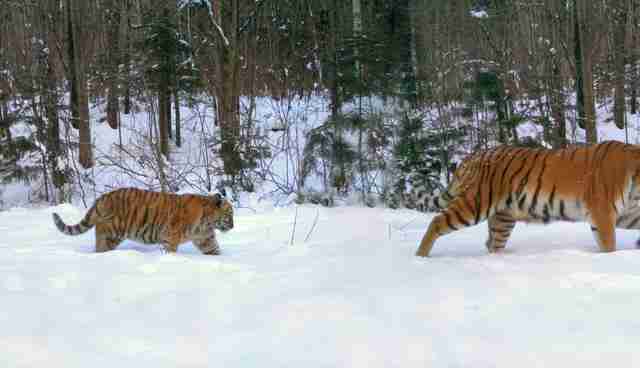 A camera set up by the Wildlife Conservation Society (WCS) in a remote Russian forest captured a never-before-seen sight: An Amur tiger dad leading a female adult and three cubs through the snow. Most male tigers are usually solitary animals. The images confirm that some male Amur tigers, also called Siberian tigers, do in fact participate in family life, according to the WCS. 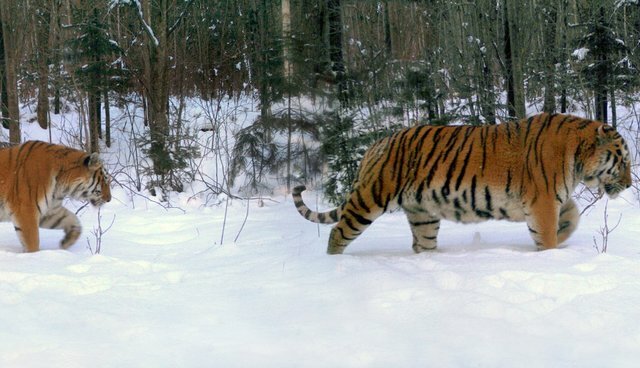 Dale Miquelle, the WCS's Russia director, said in a release that this is the first time such behavior has been photographed for Amur tigers in the wild. "These photos provide a small vignette of social interactions of Amur tigers, and provide an evocative snapshot of life in the wild for these magnificent animals," he added. The sight is an incredibly rare one, but just catching one of the animals on camera is a feat in itself. Hunting nearly drove Amur tigers - an endangered species - to extinction by the 1940s. But an aggressive conservation campaign and a ban on international trade of their parts has helped their populations rise. There are about 450 Amur tigers in the wild, a population that the World Wildlife Fund considers stable for the time being.